The profit share of the non-financial corporations sector grew compared to the previous quarter as the sector's value added grew more than compensation of employees. The investment rate of non-financial corporations also improved clearly from the previous quarter. The saving rate of the households sector weakened in the second quarter compared with the first quarter as a result of strong growth in consumption expenditure. Adjusted disposable income describing households' economic well-being contracted slightly year-on-year. These data derive from Statistics Finland’s quarterly sector accounts. In the second quarter of 2016, the profit share of non-financial corporations, or the share of profits in value added, grew by 1.4 percentage points to 26.6 per cent. The investment rate of non-financial corporations, or the proportion of investments in value added, increased by 0.9 percentage points to 26.7 per cent. The key figures were calculated from seasonally adjusted time series. 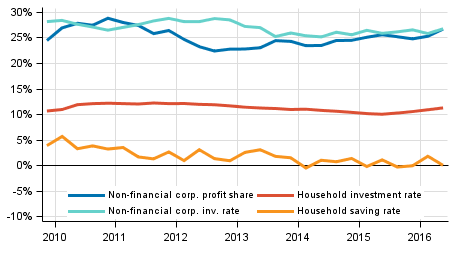 In April to June, households' saving rate declined by 1.7 percentage points to 0.0 per cent. The saving rate refers to the share of savings in disposable income. The investment rate of households grew by 0.3 percentage points and was 11.2 per cent of their disposable income. Households' seasonally adjusted investment rate has now grown during four quarters. Most of households' investments were investments in dwellings. Households' adjusted disposable income fell from the corresponding quarter in 2015 by 0.4 per cent adjusted for price changes. Adjusted income is the indicator recommended by the OECD for evaluating the economic well-being of households. Adjusted disposable income is derived by adding individual services produced by the public sector, such as education, health and social services, to the disposable income of households. ISSN=2243-4992. 2nd quarter 2016. Helsinki: Statistics Finland [referred: 19.4.2019].